What do you do when you can’t decide between a brownie and a cookie? Make brookie cookies! 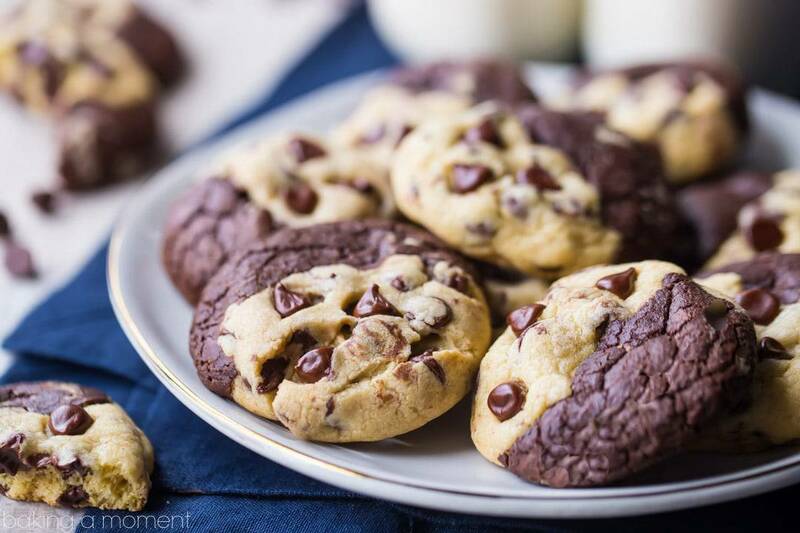 With a dark chocolate-y brownie on one side, and a soft chocolate chip cookie on the other, you can’t go wrong! 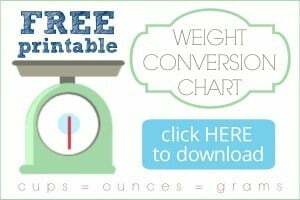 I’m so happy to be sharing this recipe with you today! I made these brookie cookies a few weeks ago, and they were a HUGE hit! Everyone who I shared them with went gaga over them. Can you blame them? 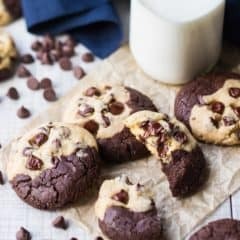 I mean seriously, what could be better than eating a dark chocolate brownie AND a chocolate chip cookie, all in one glorious bite? 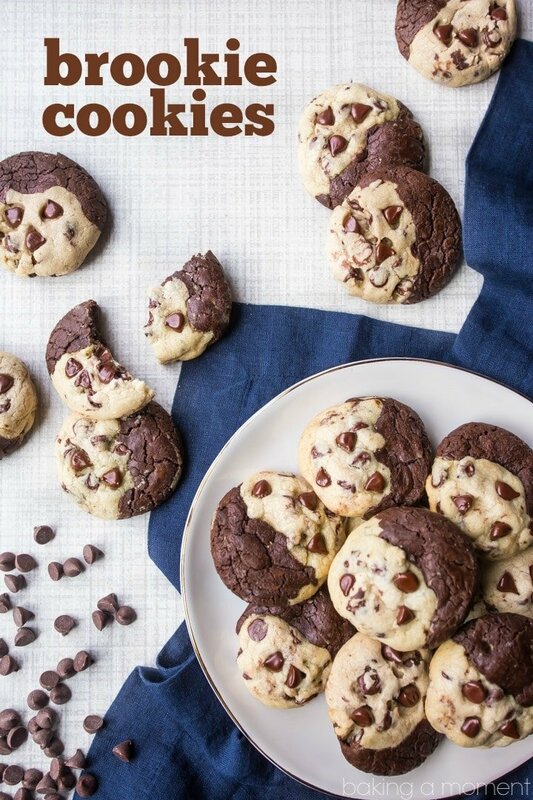 These brookie cookies are truly the best of both worlds. If you have a chocolate craving, you’ve gotta bake up a batch! It’s as easy as mixing up two kinds of dough, scooping balls of each, and then smooshing them together and baking them. The brownie side of the cookie is based on my Simply Perfect Brownies recipe, and it’s soooo dark chocolate-y, fudgy, and dense. 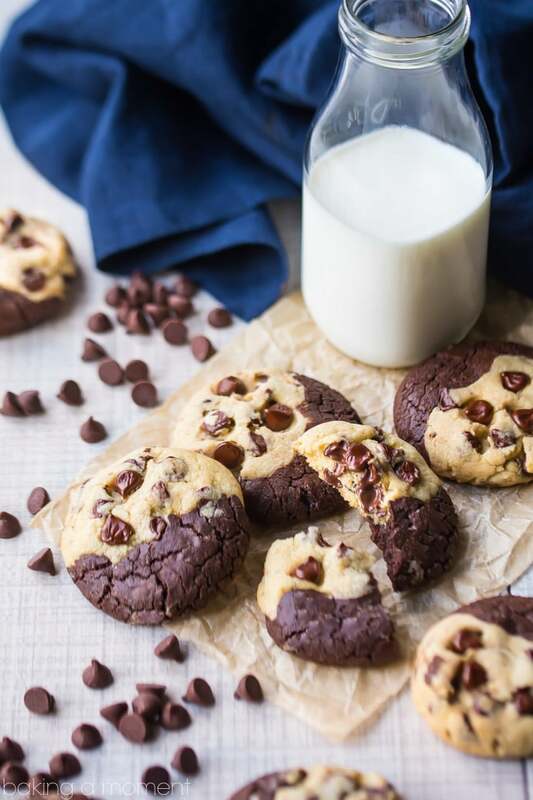 And the chocolate chip cookie side is just my favorite Soft Chocolate Chip Cookies recipe. Buttery, soft, and just bursting with melty chocolate chips. I’ve been making both these recipes for years, so it was only a matter of time before they met, fell in love, and had adorable brookie cookie babies. I hope you enjoy these brookies as much as my friends and family did! What do you do when you can't decide between a brownie and a cookie? Make brookie cookies! With a dark chocolate-y brownie on one side, and a soft chocolate chip cookie on the other, you can't go wrong! Place the sugar, butter, and cocoa in large, microwave-safe bowl (loosely covered), and microwave in 1-minute intervals until the butter is completely melted. Add the eggs, one at a time, stirring after each addition until completely incorporated. Add the flour, baking powder, and salt, stirring together until smooth. In a large mixing bowl, cream the butter, brown sugar, and granulated sugar together until very pale and fluffy (about 5 minutes on medium-high speed). Add the egg, and mix until completely incorporated. Scrape the bottom and sides of the bowl with a silicone spatula, then add the egg yolk and vanilla, mixing until blended. Scrape the bottom and sides of the bowl with a silicone spatula, then add the flour, cornstarch, baking soda, and salt. Mix until all the dry ingredients are incorporated, then stir in the chocolate chips. Scoop about 1 1/2 tablespoons of the chocolate chip cookie dough. Scoop about 1 1/2 tablespoons of the brownie cookie dough. Press both kinds of dough together, and roll into a ball. Place on the prepared baking sheets, and bake for 10 to 12 minutes, or until just beginning to turn golden around the edges. Brookie cookies will keep in an airtight container for about 1 week at room temperature, 2 weeks in the refrigerator, and 2 months in the freezer. Hi Allie, Can’t wait to try these brookie cookies. My teen is going to flip for these. Pinned for later. Aw, that’s awesome! Hope you and your teen enjoy! Two of our favorite desserts in one! These look scrumptious!!! These cookies are simply heaven! Looks divine and I’m definitely going to try this recipe soon! So happy you like them Natalie! Ahhh the best of both worlds! I noticed that the brownie batter is a bit thinner than the chocolate chip cookie batter. It is difficult to scoop — kind of sticky. I am trying to refrigerate it for a bit to firm it up. But the first tray of cookies look amazing! Thank you. Yes the brownie batter will be a little thinner until it’s cooled. It’s because of the melted butter. Glad they’re coming out well for you! These look really delicious! Can both batters be made ahead and stored in the fridge for a day or two before assembly and baking? Hey Lisa! So happy you like them! If you go that route, just be sure to wrap the doughs up very tightly. They will tend to dry out as they sit (especially the chocolate chip cookie one). Good luck and I hope you enjoy! Would these work as a bar cookie with one dough on top of the other? Hey Eileen! That sounds like a great idea. I’m sure it would be delicious! I am just wondering if this will work with boxed brownie batter? I’m not sure how you would do that…?